What do modern designer ceiling lights look like? Which designer ceiling light goes best in which room? Which brands manufacture designer ceiling lights? Which lighting technology do designer ceiling lights use? LEDs mean that designers can now produce new, extremely slim designs – the lighting technology has lots of benefits in terms of the environment and financial savings too. 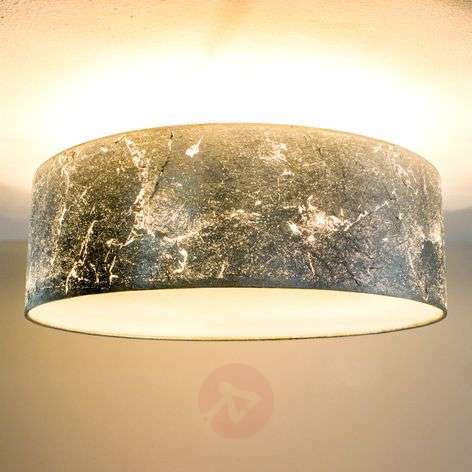 Designer ceiling lights: room lighting for connoisseurs! You are familiar with names such as Artemide, FLOS and SLAMP? Perhaps you have already chosen your favourite brands and prefer the creativity of an Ingo Maurer or the highly functional elegance of a Bopp. 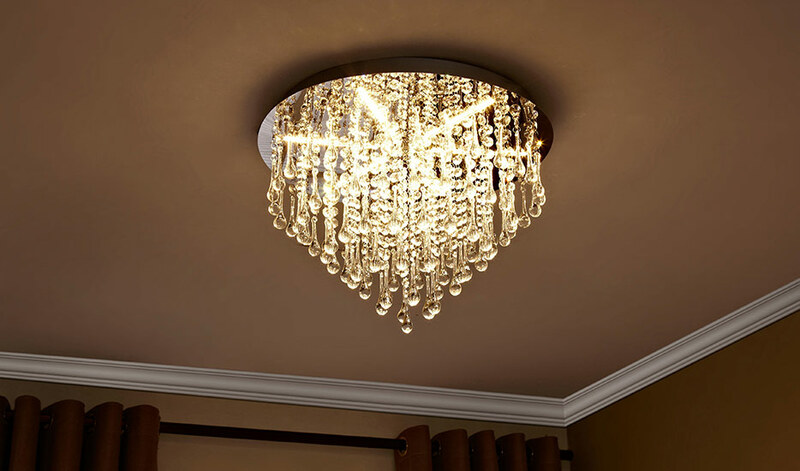 One thing’s for sure: you know that, with designer ceiling lights, you can make your home even more stylish. 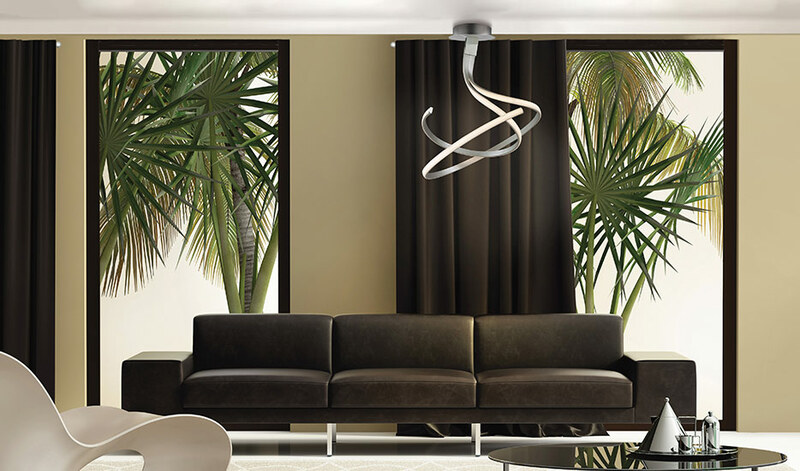 Do you expect extraordinary design from a designer ceiling light? Then you will certainly find what you are looking for. However, design has always meant more than just “striking”. Over a century ago, the masters of the Bauhaus movement, such as Professor Wilhelm Wagenfeld, knew that simple, functional design is not just timeless, but stylish too! “ It is no exaggeration to say that original design classics tend to stick around for several decades”, confirms Carsten Hotzan, Managing Director of Tecnolumen. 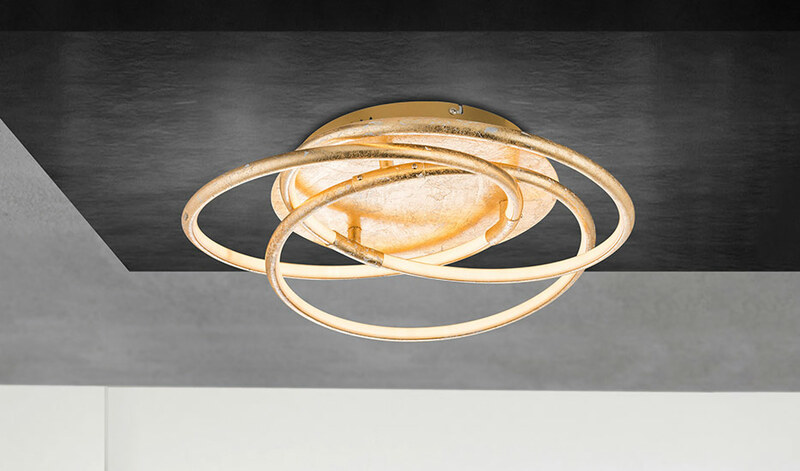 And many of the latest, modern designer ceiling lights actually have a simple design as a result. LED lighting technology has played its part here. This compact lighting technology makes it possible to create slim, rod-shaped designs. They are very much in line with the Bauhaus philosophy thanks to their linear design and focus on functionality. Furthermore, excellent brightness from a hidden light source has a futuristic feel. Gold-coloured designer ceiling lights create striking contrasts in light interiors and metal leaf surfaces are extremely IN at the moment. The surface is not smooth; instead it has a unique structure (as though it has been hit with a hammer). Gold-coloured lights impress in any living space – just imagine greeting your guests with a light like this in your hallway! Frames made of wood are the number one choice when it comes to creating a cosy ambience. They are as popular in Scandi styles as they are in modern, uncluttered, minimalist designs. There is something charming, warm and gentle about wood, which has a big impact on the feel-good atmosphere in the room in question. Glass lampshades do not need to be matt and hemispherical. Modern glass lights come with thin, high-quality panes of glass that sit in front of hugely powerful LEDs. The design is as minimalist as possible and looks lightweight, yet it is never fragile. In the kitchen, minimalist design like this can be used to highlight state-of-the-art kitchen appliances with high-gloss stainless steel, as well as networked kitchen equipment and ergonomic systems. The living room is pretty much made for a designer ceiling light, as this is where you (and your guests) will spend the majority of your time. Furthermore, the ceiling light is the first choice when it comes to providing the necessary general lighting. You only have a few light sources in the room and the ceiling light needs to be the main source of illumination? Then make sure that the light is not just decorative, but also emits sufficient light. After all, being a light designer means fulfilling the customer’s lighting requirements. “ In the case of a brand like Fontana Arte, the amount of light and the type of light tend to go along with the impression that the customers have of the lights [...]. The design of the housing is just as important as the light that is generated”, explains Fontana Arte designer Francesco Librizzi aptly. The bathroom places a key constraint on your design desires: namely the protection zones within a bathroom. 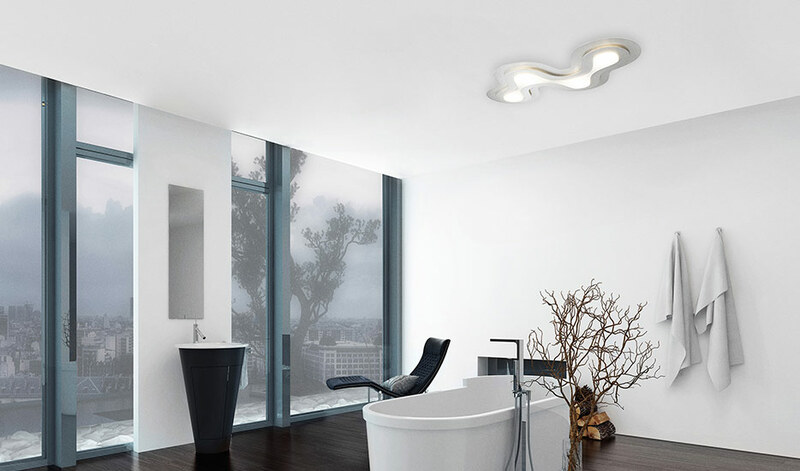 When choosing a designer ceiling light for the bathroom, the most important thing to note is the IP code, which describes the level of protection against moisture and foreign bodies. The bathroom is counted amongst the moisture-prone rooms – as such, the use of a light with an appropriate IP code is mandatory. IP44 lights are often used in bathrooms. But the closer the light is situated to the shower or bathtub, the greater the degree of protection required. Our experts are on hand to help you here. The contact information is listed below. Stylish designer ceiling lights look great in the bedroom. In the form of a gold-coloured fabric ceiling light, for example. Fabric ceiling lights impress not only with their homely feel, but also due to their pleasantly soft light. Fabric lampshades act like a diffuser and lend the light a cosy feel. Playful models like the Veli by Slamp or the slim LED models from Escale are also popular. The most important thing for this room is to make sure that everything is designed to increase the level of comfort. For some, wood is perfect for this; others prefer fabric or even a chrome ceiling light. What does cosiness mean to you? There are different requirements when it comes to working spaces. Comfortable lighting like that emitted by fabric ceiling lights makes you more likely to want to close your eyes, rather than keep them open and fight through the piles of paperwork. Simple Bauhaus lamps or minimalist LED ceiling lights provide stylish lighting in an office and don’t fall short in terms of design either. And that is not all: while warm white lighting is best for the living room, cool white light provides clinical efficiency in the office. Take note of this when buying LED light bulbs (for designer ceiling lights with a socket) or designer lights with built-in LED lighting technology. You can find this information under luminous colour in the product details of the Lights.ie online shop. The most well-known designer brands manufacture excellent ceiling lights. Despite this, there are fewer designer ceiling lamps than designer hanging lights or designer table lamps because ceiling lights often lie outside the field of vision due to their installation location. A hanging light that projects into the room, or a table lamp that sits on a side table is seen far more; and most designers want their creations to be seen! Designer ceiling lights tend to project far more as a result. By contrast, classic Bauhaus lights have a subtler appearance – they are more about the light itself. 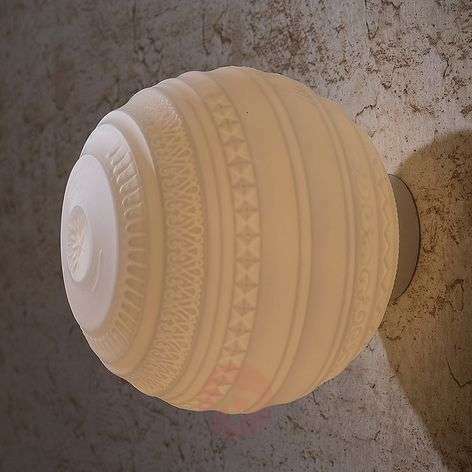 Designer ceiling lights by Slamp are creative and playful in style. 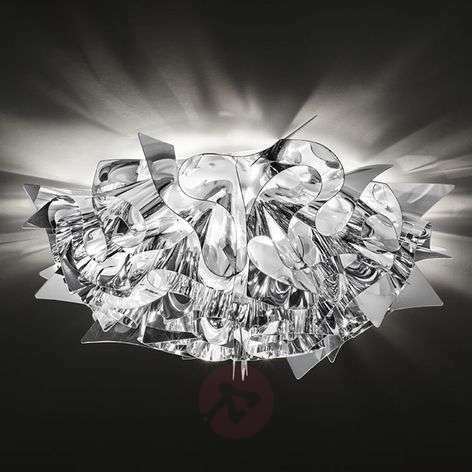 Artemide opts for a high degree of functionality for its ceiling lights and other lights. Ceiling lights by FLOS impress thanks to their structured light or the material. Bopp packs high-quality LED technology into minimalist designs. Ceiling lights by Tecnolumen are Bauhaus products and combine functionality with a design that was as en vogue a century ago as it will be in another hundred years. It is also worth taking a look at the designer lights by Lampenwelt.com. 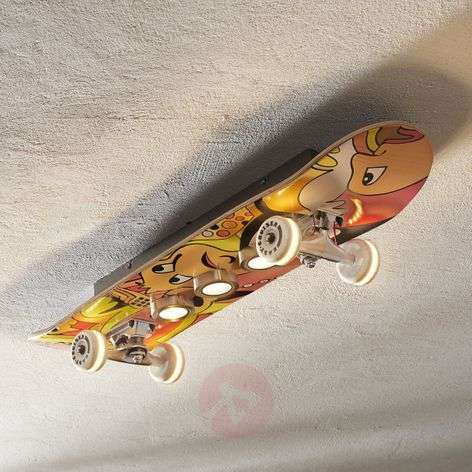 You are keen to discover more designer ceiling lights? Just take a look in our brand shop and find your favourite design companies. Many designers use conventional sockets in their ceiling lights. And why not? After all, you can screw in or plug an LED light bulb into any socket. Despite this, there are many benefits for designers relying on built-in LED lighting technology. It allows for completely novel designs thanks to the compact size of the small LEDs. As ceiling lights provide general lighting for rooms, designer ceiling lights are often dimmable including those with LED lighting technology. Ensure that there is a “Yes” next to “Dimmable” in the product details. If the dimmer is not included (see “Dimmer”, “Not included”), then simply call our experts and ask for information about compatible dimmers. The contact information is listed below. Do you have any other questions about designer ceiling lamps, well-known designer models or about whether lights can be dimmed or not? Our team of experts is happy to help. Simply call us on +353 1 699 2138 or write to us using the contact form.